Cleveland, OH (December 18, 2018) – The Cleveland Museum of Art (CMA) today announced the opening of its reimagined Northern European galleries (213–15) featuring art of the Netherlands, Germany, Central Europe, and France from about 1600 to 1725. The completely redesigned galleries feature a selection of beloved masterworks from the permanent collection as well as several important new acquisitions on view for the first time. The installation also explores the context in which these works might originally have been displayed: an upper-middle-class Dutch home; an ecclesiastical setting, such as a church or private chapel; and an aristocratic French collection. The re-installation of the Northern European galleries is made possible with support from the newly created Sally and Sandy Cutler Strategic Opportunities Fund, established by CMA trustee Sally Cutler and her husband, Sandy Cutler. The Harold C. Schott Foundation Gallery (213) focuses on the types of paintings and decorative arts that might have been found in the home of a wealthy Dutch family around 1650. Much of the art produced and collected during this period consisted of portraits, landscapes, still lifes, and genre scenes. New acquisitions on display for the first time include Dirck van Baburen’s Violin Player with a Wine Glass and Jacob van Hulsdonck’s Still Life with Meat, Fish, Vegetables, and Fruit. Acquired in June 2018, Violin Player with a Wine Glass depicts an exuberant figure who seems to burst into the room with an infectious smile. Jacob van Hulsdonck’s colorful and enticing Still Life with Meat, Fish, Vegetables, and Fruit, acquired in December 2018 as generous gift from Janice Hammond and CMA trustee Edward Hemmelgarn, is among the largest and most elaborate of the artist’s table-top still lifes. The global reach of the Dutch mercantile and seafaring empires is suggested in the presence of blue-and-white ceramics imported to the Netherlands from China and Japan, as well as the local Delft earthenware they inspired. Evocative landscapes by Jan van Goyen, Meindert Hobbema, Jacob van Ruisdael, and their contemporaries celebrate the subtle pleasures of the Dutch countryside. The new installation also incorporates a number of works that had previously been in storage, emphasizing the richness and depth of the CMA’s collection. In the Walter and Jean Kalberer Foundation Gallery (214), the museum’s remarkable collection of wood sculpture from Germany and Central Europe is on display, with the presentation refined to provide a clearer understanding of the works’ original setting in chapels, churches, and devotional spaces. 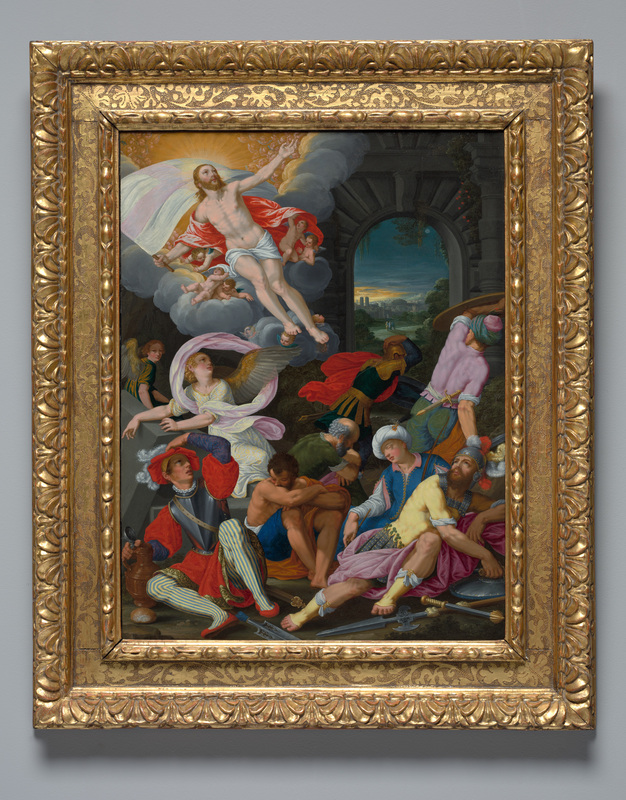 Also featured here is another important recent acquisition: a vivid and dynamic painting on copper of Christ’s resurrection by Johann König, the most important artist active in Augsburg and Nuremburg in the early 1600s. The Samuel Rosenthal Family Gallery (215) has similarly been reconfigured and features a new, historic wall color and a new arrangement of works to evoke the private spaces inhabited by the French aristocracy during the period around 1725. The esteemed royal cabinetmaker André-Charles Boulle is represented with a stunning cabinet, richly ornamented with his signature technique of metal marquetry (brass or pewter inlaid on tortoiseshell) and gilt-bronze mounts. A remarkable suite of furnishings from the Savonnerie textile manufactory is represented by a magnificent wall hanging and four upholstered chairs. The suite, ordered as a royal gift to honor the marriage of two noble families, depicts the four seasons, scenes from ancient fables, and the coats of arms of two families. Complementing the decorative arts is a selection of paintings that probably once adorned the homes and palaces of French aristocrats. These works include flamboyant portraits like that of Cardinal Guillaume Dubois by Hyacinthe Rigaud; elegant historical or mythological scenes, like Jean François de Troy’s sensual depiction of Pan and Syrinx; and a selection of fine seventeenth-century Dutch paintings, which were highly valued and assiduously collected by elite French connoisseurs. 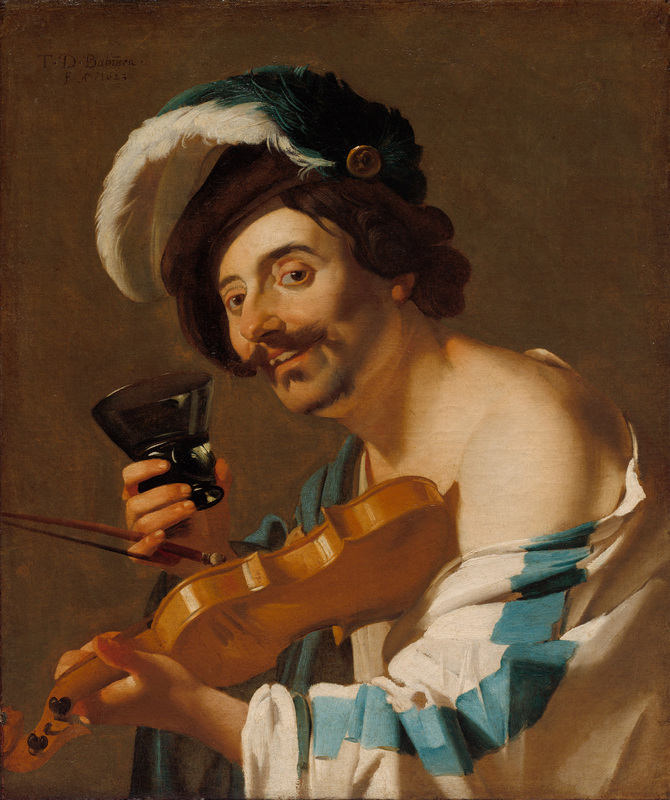 Violin Player with a Wine Glass represents one of the most characteristic themes addressed by Dirck van Baburen: a half-length figure of a musician, depicted life-size and close to the picture plane. The violin player’s colorful dress marks him as a marginal figure—an impression reinforced by the man’s bold gaze, unshaven face, and cheeky grin complete with a broken tooth. The playful naturalism of Baburen’s painting reflects a typically Dutch interpretation of the Caravaggesque style: an unaffected character who openly enjoys life’s sensual pleasures—music and drink, with a hint of bared flesh. 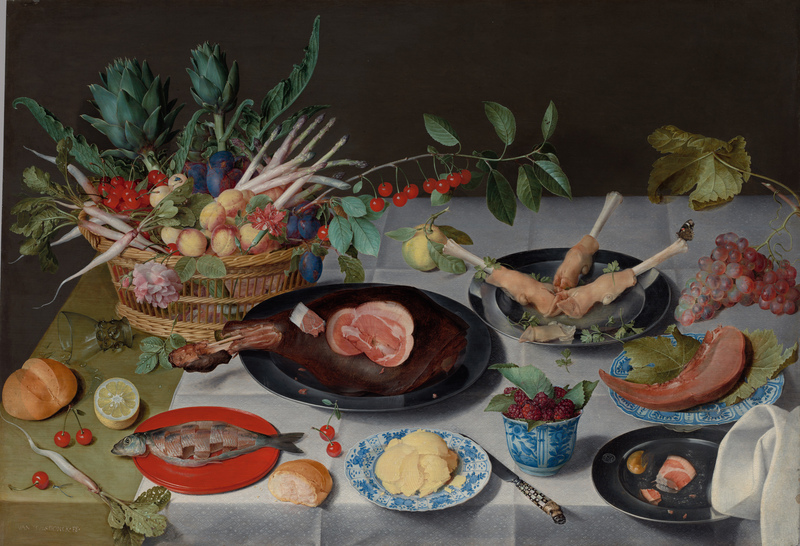 The unusually large scale and wide variety of beautifully painted objects depicted in Still Life with Meat, Fish, Vegetables, and Fruit make it one of Jacob van Hulsdonck’s finest achievements. A humble earthenware trencher sits side by side with pewter plates and delicate Chinese porcelain typical of those imported from Asia by merchants of the Dutch East India Company. The foods are a mix of the mundane—bread, butter, and herring—and seasonal delicacies like berries and stone fruits. Hulsdonck’s precise brushwork and vibrant palette entice the viewer and invite appreciation of the artist’s ability to re-create the sensuous and tactile qualities of this sumptuous feast. Johann König’s interpretation of Christ’s resurrection draws on traditional iconography: released from his tomb, a triumphant Christ soars toward heaven’s golden light, holding in his right hand the banner of resurrection. Around the empty sarcophagus are the soldiers who were charged with guarding it. Unlike most depictions, which take place in an open landscape setting, König locates his scene within the burial chamber, using the darkness of the stone interior to heighten the impact of the blaze of heavenly light. The Cleveland Museum of Art’s collection of European painting from 1500 to 1800 is one of international importance. Areas of particular depth include Italian Baroque, including Caravaggio’s The Crucifixion of Saint Andrew, and 17th-century Dutch painting, among them Frans Hals’s masterpiece Portrait of Tieleman Roosterman. There are highly significant holdings in Spanish Baroque, including Francisco de Zurbarán’s Christ and the Virgin in the House of Nazareth, and 17th-century French painting, of which Nicolas Poussin’s The Holy Family on the Steps is a highlight. The Italian Renaissance painting collection also has major works, as do the 18th-century French and British holdings. The sculpture collection maintains strengths in Renaissance bronzes and German and Austrian Baroque sculpture. The portrait miniature holdings are among the most outstanding in the world. The collection is one of the most visible areas of collecting in the museum because works are displayed alongside paintings and sculpture of similar eras or origin in galleries located throughout the museum. The works that appear on view are of very high quality and visual interest. The best American material can be found in the galleries devoted to 19th- and 20th-century art, while European furniture, silver, and ceramics from the 16th to the 19th centuries form one of the strongest collections in the museum. In particular, the works of Limoges enamel, Italian maiolica, German and French silver and ceramics, and French 18th-century furniture are among the best in the United States and known internationally through scholarship and exhibitions. Significant works in 19th- and 20th-century decorative arts have been added in recent years, making this an emerging strength in the museum’s collections. The work by Peter Carl Fabergé circa 1900 is considered some of the finest of its type in the world.